Copyrights: ©2015 Yamamoto T. This is an open-access article distributed under the terms of the Creative Commons Attribution License, which permits unrestricted use, distribution, and reproduction in any medium, provided the original author and source are credited. Palmoplantar pustulosis (PPP) is characterized by many aseptic small pustules, scales, crusts and erythemas, involving the palms and soles. PPP is frequently seen in Japan, and thus considered as a distinct entity. By contrast, in other countries, PPP is sometimes regarded as an acral variant of pustular psoriasis. Typical clinical features definitely differ between PPP and plaque-type psoriasis, however, in rare cases, PPP presents with features resembling psoriasis vulgaris or pustular psoriasis with palmoplantar pustulation. Although extra-palmoplantar lesions of PPP are not psoriasis, patients with PPP rarely show typical psoriasis during the course. On the other hand, patients with generalized pustular psoriasis (GPP) can exhibit pustular lesions on the palms and soles. Those findings strongly suggest a close relationship between PPP and psoriasis, however, there are a number of differences between PPP and pustular psoriasis. In this review, clinicopathological aspects of PPP are described, and the difference from pustular psoriasis is discussed. Palmoplantar pustulosis; Palmoplantar psoriasis; Pustular psoriasis. Palmoplantar pustulosis (PPP) is characterized by aseptic small pustules, scales, crusts and erythemas on the palms and soles. The frequency of this disease varies among different countries, and frequently observed in Japan. PPP is sometimes regarded as a localized variant of pustular psoriasis, while others consider PPP to be a distinct nosological entity, different from psoriasis [1-3]. The controversial viewpoints may depend on the different frequency of PPP. Undoubtedly, PPP is closely related to psoriasis, and both disorders share common pathogenesis in a number of aspects. The author has been standing a position that PPP is a distinct entity different from pustular psoriasis. In this review, a close relationship and differences between PPP and pustular psoriasis have been discussed. PPP has a predilection for females, and involves middle-aged women, usually occurring at the age between 30-40 years. In the majority of patients, bilateral palmar lesions antecede the plantar involvement with a few months duration. On the other hand, only palmar involvement is occasionally seen, while incidence of only sole involvement is much lower. Patients, especially women patients, are either current or previous smokers, and nicotine included in tobacco is suggested to play a role. PPP lesions are typically confined to the palms and soles, while a number of erythematous lesions with scaling sometimes appear on the trunk and/or extremities. Those extra-palmoplantar lesions are seen either chronically or suddenly accompanied by joint pain, following focal infections such as tonsillitis, dental infections, and sinusitis . In the cases of acute onset, solitary pustules may also be seen on the trunk, however, severe cases mimicking pustular psoriasis are also seen. In general, extra-palmoplantar lesions are seen more frequently in patients with severe PPP. Compared with psoriasis, infiltration of the erythema is mild and the lesions are neither well demarcatednor accompanied by thickened scales. Nail lesions are frequently seen in PPP, such as subungual pustule, hyperkeratosis, dystrophy, onycholysis, when inflammation involves the nail matrix. Histological features of pustular lesion of PPP are the same with GPP, showing intraepidermal infiltration of polymorphonuclear neutrophils formingsubcorneal abscess, acanthosis, and cellular infiltrates in the papillary dermis. Although the mechanisms of neutrophil chemotaxis towards the epidermis are unknown, selective accumulation of neutrophils may be caused by the local generation of neutrophil-specific chemoattractants, i.e.interleukin-8 (IL-8), growth-related oncogene-α (GRO-α), C5a, platelet-activating factor, and leukotriene B4. Additionally, a number of T-cells are infiltrated below and around the neutrophilic abscess, which is suggested to play an important role by releasing inflammatory cytokines. Among them, tumor necrosis factor-α (TNF-α) induces IL-8 production by peripheral mononuclear cells . IL-8 has been implicated to play an important role in neutrophil recruitment in the lesional skin. In addition, IL-23/IL-17 inflammatory pathway has recently been suggested to be important in PPP. IL-17 promotes neutrophil migration via the release of CXC chemokines . IL-17 activates endothelium to lead to neutrophil infiltration in a p38 MAPK-dependent manner . In addition, IL-17 and TNF-a enhance endothelial expression of neutrophil chemokines, i.e. CXCL1, CXCL2 and CXCL5, leading to leukocyte migration . Serum levels of IL-17 and IL-22 are increased in patients with PPP . IL-23 expression is upregulated in the lesional skin of PPP ,and IL-17 is detected close to or in the acrosyringium . Acrosyringium is reported to be the primary target for inflammation in PPP [12, 13]. Acetylcholine is the main inducer of sweating, and many components for cholinergic signaling have been found in the skin. Nicotine acts on nicotinic acetylcholine receptor AChRs (nAChRs) as an agonist, which then leads to the provocation of many functions. In PPP lesional skin, altered nAChR expression was observed, and epidermal α7nAChR expression was abolished compared with normal skin . Patients with PPP may be incapable of activating the endogenous nicotinic anti-inflammatory pathway, due to a decrease of α7nAChR, and show abnormal response to nicotine. PPP is frequently associated with foci of chronic bacterial infection . Bacterial products stimulate enhanced production of IL-23, which triggers T-cells to produce IL-17. Tonsillitis is the most closely associated focal infection with PPP, and tonsillectomy improves and even completely releases cutaneous as well as skeletal lesions . In addition, odontogenic infection, sinusitis, cholecystitis, and appendicitis also sometimes precede the onset of PPP. These facts strongly suggest a key triggering role of bacterial infection leading to a sequential event inducing PPP. In vitro, bacterial infection activates tonsillar T-cells to enhance cutaneous lymphocyte-associated antigen (CLA) expression  and enhances cytokine production such as IL-6, TNF-α, and interferon-γ (IFN-γ) . Toll-like receptors (TLRs) play important roles in the innate immune responses following bacterial infection. Heat shock proteins (HSPs) are recognized by γδ T-cell receptors and TLR-2 and -4 , and may act as an endogenous and/or exogenous signal to trigger immune responses. TLRs signal the presence of an infection and direct the adaptive immune response against microbial antigens by inducing proinflammatory cytokines and upregulating costimulatory molecules of antigen presenting cells. On the other hand, the exacerbation of GPP is triggered by infection, pregnancy and various drugs such as corticosteroids, terbinafine, ciprofloxacin, amoxicillin, isoniazid, and so on. Occasionally, it is difficult to differentiate acute generalized exanthematouspustulosis (AGEP). Many of those agents or factors induce TNF-α, which plays a crucial role in the induction of GPP. By contrast, PPP-like lesions, and rarely GPP, are induced by anti-TNF drugs, as a paradoxical reaction. Patients with psoriasis vulgaris occasionally develop predominantly on the palms and/or soles, which is called palmoplantar psoriasis (Figure1). Infiltrative keratotic erythemas are seen, but absent from pustular lesions. Patients develop typical psoriatic plaques on other sites than palmoplantar areas. On the other hand, patients with PPP develop hyperkeratotic lesions especially on the soles (Figure 2). Those cases indicate clinical similarities of both diseases, and extra-palmoplantar lesions associated with PPP sometimes present with features resembling psoriasis. Co-existence of typical features of PPP on acral sites and typical psoriasis on the elbow or knees is rarely seen (Figure 3a, 3b). In Japan, PPP is frequently seen, however, true collision of PPP and psoriasis is extremely rare. Ammoury et al. also reported that plaque psoriasis at distant sites from PPP is exceptional, and concluded that PPP should not be considered as a variant of psoriasis. erythroderma. Pustular psoriasis is divided into generalized and localized, and the former type includes Zumbusch type, impetigo herpetiformis (acute GPP of pregnancy), annular and circinate form, juvenile and infantile pustular psoriasis, and generalized form of acrodermatitis continua (Hallopeau). PPP was previously known as ‘pustular psoriasis of the extremities’. Baker and Ryan  formerly classified GPP into several subgroups including the "palm-sole" type. Both PPP and GPP are characterized by aseptic pustular formation, which reflect enhanced activity of neutrophil recruitment to the skin. The pustular lesions present not as solitary pustules, but as coalescent sheet-like pustular formations. These facts may suggest that PPP is the palm-sole type of GPP. 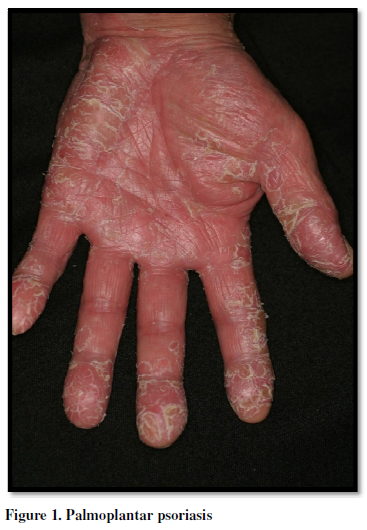 Clinical appearances between both diseases are different, however, patients with GPP sometimes present with severe pustular lesions on the palms and/or soles . Infantile GPP is seen, although rare, whereas there are no pediatric cases of PPP. GPP is recently implicated as one of autoinflammatory diseases . IL-36-α, -β, -γ are novel members of IL-1 family, which bind to the IL-36 receptor and lead to the activation of nuclear factor-κB (NF-κB) and mitogen-activated protein kinase (MAPK) pathways. IL-36 receptor antagonist (IL-36RN) antagonizes the activity of IL-36. Recent studies have shown a significant role of IL-36 in psoriasis ,and in particular, genetic analysis has revealed the mutations of IL-36RN in familial and also sporadic occurrence of GPP [24-28]. A deficiency of IL-36RN leads to the excessive IL-1 production and overproduction of IL-8 in keratinocytes in response to IL-36. By contrast, although there are few findings indicating the possibility that PPP is also regarded as an autoinflammatory condition, mutations of the IL-36RN gene has recently been reported to rarely underlie in some cases with PPP as well asacrodermatitis continua (Hallopeau) , suggesting that there may be a certain genetic backgrounds in common among GPP, PPP and acrodermatitis continua, or rather suggesting that the cases manifesting symptoms of PPP with such gene mutations may not be truly PPP. Acquired factors, such as environmental or life-style issues, need to be elucidated to distinguish between localized and generalized diseases, if they are on the same spectrum of pustular neutrophilic disorders. The IL-19 subfamily of genes located on chromosome 1q31-32 has been suggested to be potentially susceptible to PPP . IL-20 haplotype GAA is associated with an increased susceptibility, while GGG is associated with a decreased susceptibility, to PPP. In addition, PPP showed no association with PSORS1 , and TNF-238 and -308 promoter polymorphism are associated with psoriasis but not with PPP . Recently, the co-morbidities associated with PPP have been surveyed . However, in this report, the representative co-morbidities with psoriasis, such as cardiovascular diseases including ischaemic heart disease, hypertention, and dyslipidaemia, were presented in a high ratio. Furthermore, they described that psoriatic artyhropathy was present in 12%. It is highly suspected that they enrolled many patients with either palmoplantar psoriasis or palmoplantar pustular psoriasis in their study. Whether the examined patients are truly PPP, not psoriasis, may be doubtful. On the other hand, because GPP is a severe form of psoriasis, many conditions such as arthralgia, metabolic syndrome, cardiovascular event, ophthalmological involvement, and inflammatory bowel diseases are accompanied. In addition, cholestasis frequently occurs in patients with GPP, and liver biopsy revealed neutrophilic cholangitis , which suggest a pathogenic role of activated neutrophils for liver damages. So far, pulmonary involvement in the course of psoriasis was estimated to be extremely rare, and only a few cases of acute respiratory distress syndrome were reported in association with GPP and/or psoriatic erythroderma [35, 36]. Possible aetiologies such as microbial infection, drug-induced reaction and capillary leak syndrome, via proinflammatory cytokines such as TNF-α, IL-6, and IL-8, have been proposed. The comparison of PPP and GPP is shown in Table 1. Although there are many features of clinical symptoms including nail abnormality and joint involvement in common, several different aspects should also be recognized. Recently, psoriasis is regarded as a systemic inflammatory disorder, and various organ involvements are seen in patients with severe psoriasis, especially with GPP, i.e. cardiovascular disease, inflammatory bowel disease, joint manifestations, uveitis, acute respiratory distress syndrome, and chronic kidney disease. By contrast, organ involvement in association with PPP still needs further investigations. 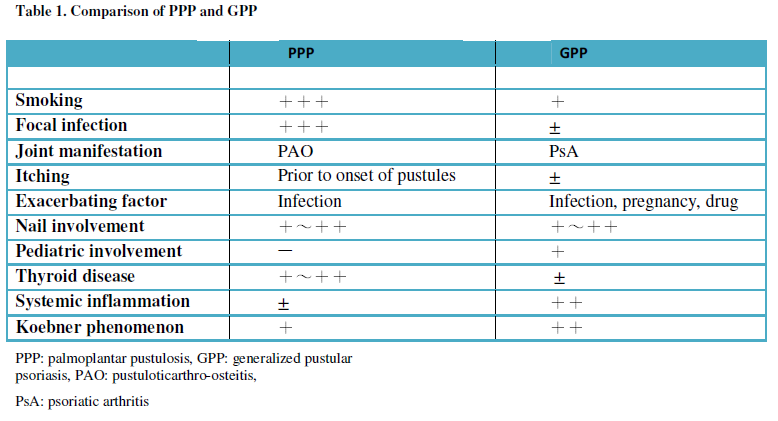 Although PPP sometimes shows features overlapping with either psoriasis or GPP, and both PPP and GPP are included in autoinflammatory pustular neutrophilic diseases , PPP nevertheless should be regarded as a distinct entity, different from acral variant of GPP. The author states no conflict of interests. 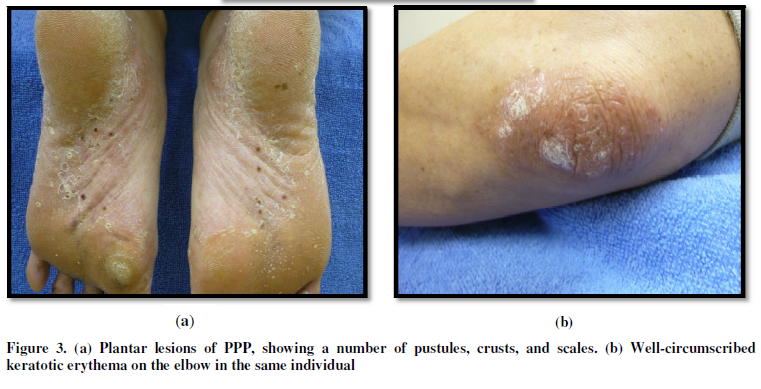 1 Brunasso AMG, Massone C (2010) Can we really separate palmoplantar pustulosis from psoriasis? J Eur Acad Dermatol Venereol 24: 619-621. 2 Yamamoto T (2010) Can we really separate palmoplantar pustulosis from psoriasis? Reply. J Eur Acad Dermatol Venereol 24: 621. 3 de Waal AC, van de Kerkhof PC (2011) Pustulosispalmoplantaris is a disease distinct from psoriasis. J Dermatolog Treat 22: 102-105. 4 Yamamoto T (2009) Extra-palmoplantar lesions associated with palmoplantar pustulosis. J Eur Acad Dermatol Venereol 23: 1227-1232. 5 Andoh A, Ogawa A, Kitamura K, Inatomi O, Fujino S, et al. (2004) Suppression of interleukin-1β- and tumor necrosis factor-a-induced inflammatory responses by leukocytapheresis therapy in patients with ulcerative colitis. J Gastroenterol 39: 1150-1157. 6 Laan M, Cui ZH, Hoshino H, Lötvall J, Sjöstrand M, et al. (1999) Neutrophil recruitment by human IL-17 via C-X-C chemokine release in the airways. J Immunol 162: 2347-2352. 7 Roussel L, Houle F, Chan C, et al. (2010) IL-17 promotes p38 MAPK-dependent endothelial activation enhancing neutrophil recruitment to sites of inflammation. J Immunol 184: 4531-4537. 8 Griffin GK, Newton G, Tarrio ML, et al. (2012) IL-17 and TNF-a sustain neutrophil recruitment during inflammation through synergistic effects on endothelial activation. J Immunol 188: 6287-6299. 9 Murakami M, Hagforsen E, Morhenn V, Ishida-Yamamoto A, Iizuka H (2011) Patients with palmoplantar pustulosis have increased IL-17 and IL-22 levels both in the lesion and serum. Exp Dermatol 20: 845-847. 10 Lillis JV, Guo C-S, Lee JJ, Blauvelt A (2010) Increased IL-23 expression in palmoplantar psoriasis and hyperkeratotic hand dermatitis. Arch Dermatol 146: 918-919. 11 Hagforsen E, Hedstrand H, Nyberg F, Michaëlsson G (2010) Novel findings of Langerhans cells and interleukin-17 expression in relation to the acrosyringium and pustule in palmoplantar pustulosis. Br J Dermatol 163: 572-579. 12 Eriksson MO, Hagforsen E, Lundin IP, Michaëlsson G (1998) Palmoplantar pustulosis: a clinical and immunohistological study. Br J Dermatol 138: 390-398. 13 Murakami M, Ohtake T, Horibe Y, Ishida-Yamamoto A, Morhenn VB, et al. (2010) Acrosyringium is the main site of the vesicle/pustule formation in palmoplantar pustulosis. J Invest Dermatol 130: 2010-2016. 14 Hagforsen E, Edvinsson M, Nordlind K, Michaëlsson G (2002) Expression of nicotinic receptors in the skin of patients with palmoplantar pustulosis. Br J Dermatol 146: 383-391. 15 Yamamoto T (2013) Pustuloticarthro-osteitis associated with palmoplantar pustulosis. J Dermatol 40: 857-863. 16 Nozawa H, Kishibe K, Takahara M, Harabuchi Y (2005) Expression of cutaneous lymphocyte-associated antigen (CLA) in tonsillar T-cells and its induction by in vitro stimulation with alpha-streptococci in patients with pustulosispalmaris et plantaris (PPP). Clin Immunol 116: 42-53. 17 Yamamoto T (2011) Triggering role of focal infection in the induction of extra-palmoplantar lesions and pustuloticarthro-osteitis associated with palmoplantar pustulosis. AdvOto-Rhinolaryngol 72: 89-92. 18 Murakata H, Harabuchi Y, Kataura A (1999) Increased interleukin-6, interferon-gamma and tumor necrosis factor-alpha production by tonsillar mononuclear cells stimulated with alpha-streptococci in patients with pustulosispalmaris et plantaris. Acta Otolaryngol 119: 384-391. 19 Tsan M-F, Gao B (2004) Heat shock protein and innate immunity. Cell Mol Immunol 1: 274-279. 20 Ammoury A, Sayed FE, Dhaybi R, Bazex J (2008) Palmoplantar pustulosis should not be considered as a variant of psoriasis. J Eur Acad Dermatol Venereol 22: 392-393. 21 Baker H, Ryan HJ (1968) Generalized pustular psoriasis: A clinical and epidemiological study of 104 cases. Br J Dermatol 80: 771-793. 22 Yamamoto T (2014) Generalized pustular psoriasis: a new emerging concept relating to autoinflammatory disease. Autoimmun Dis Ther Approach 1: e103. 23 Tortola L, Rosenwald E, Abel B, Blumberg H, Schäfer M, et al. (2012) Psoriasiform dermatitis is driven by IL-36-mediated DC-keratinocyte crosstalk. J Clin Invest 122: 3965-3976. 24 Marrakchi S, Guigue P, Renshaw BR, Puel A, Pei XY, et al. (2011) Interleukin-36-receptor antagonist deficiency and generalized pustular psoriasis N Engl J Med 365: 620-628. 25 Onoufriadis A, Simpson MA, Pink AE, Di Meglio P, Smith CH, et al. (2011) Mutations in IL-36RN/IL1F5 are associated with the severe episodic inflammatory skin disease known as generalized pustular psoriasis.Am J Hum Genet 89: 432-437. 26 Farooq M, Nakai H, Fujimoto A, Fujikawa H, Matsuyama A, et al. (2013) Mutation analysis of the IL36RN gene in 14 Japanese patients with generalized pustular psoriasis. Hum Mutat 34: 176-183. 27 Sugiura K, Takemoto A, Yamaguchi M, Takahashi H, Shoda Y, et al. (2013) The majority of generalized pustular psoriasis without psoriasis vulgaris is caused by deficiency of interleukin-36 receptor antagonist. J Invest Dermatol 133: 2514-2521. 28 Kanazawa N, Nakamura T, Mikita N, Furukawa F. (2013) Novel IL36RN mutation in a Japanese case of early onset generalized pustular psoriasis. J Dermatol 40: 749-751. 29 Setta-Kaffetzi N, Navarini AA, Patel VM, Pullabhatla V, Pink AE, et al. (2013) Rare pathogenic variants in IL36RNunderlie a spectrum of psoriasis-associated pustulat phenotypes. J Invest Dermatol 133: 1366-1369. 30 Kingo K, Mӧssner R, Kõks S, Rätsep R, Krüger U, et al. (2007) Association analysis of IL19, IL20 and IL24 genes in palmoplantar pustulosis. Br J Dermatol 156: 646-652. 31 Asumalahti K, Ameen M, Suomela S, Hagforsen E, Michaëlsson G, et al. (2003) Genetic analysis ofPSORS1 distinguishes guttata psoriasis and palmoplantar pustulosis. J Invest Dermatol 120: 627-632. 32 Mössner R, Kingo K, Kleensang A, Krüger U, König IR, et al. (2005) Association of TNF-238 and -308 promoter polymorphisms with psoriasis vulgaris and psoriatic arthritis but not with pustulosispalmoplantaris. J Invest Dermatol 124: 282-284. 33 Becher G, Jamieson L, Leman J (2014) Palmoplantar pustulosis: a retrospective review of comorbid conditions. J Eur Acad Dermatol Venereol 2014 [Epub ahead of print]. 34 Viguier M, Allez M, Zagdanski AM, Bertheau P, de Kerviler E, et al. (2004) High frequency of cholestasis in generalized pustular psoriasis: evidence for neutrophilic involvement of the biliary tract. Hepatology 40: 452-458. 35 Sadeh JS, Rudikoff D, Gordon ML, Bowden J, Goldman BD, et al. (1997) Pustular and erythrodermic psoriasis complicated by acute respiratory distress syndrome. Arch Dermatol 133: 747-750. 36 Abou-Samra T, Constantin JM, Amarger S, Mansard S, Souteyrand P, et al. (2004) Generalized pustular psoriasis complicated by acute respiratory distress syndrome. Br J Dermatol 150: 353-356. 37 Naik HB, Cowen EW (2013) Autoinflammatory pustular neutrophilic diseases. Dermatol Clin 31: 405-425.